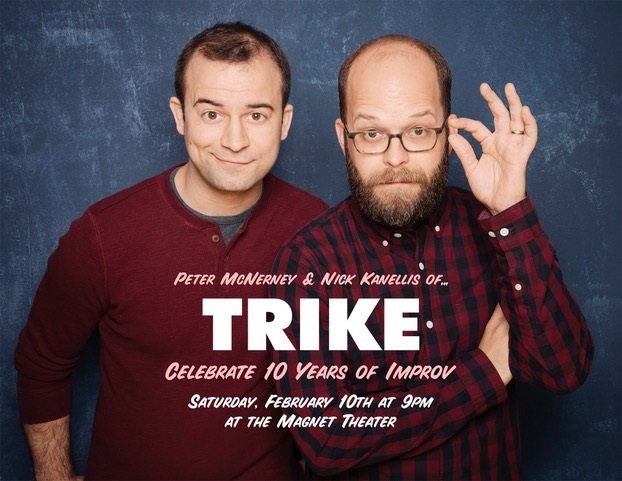 This Saturday, February 10th, is the 10-year anniversary of Peter McNerney and Nick Kanellis performing together as an improv duo! 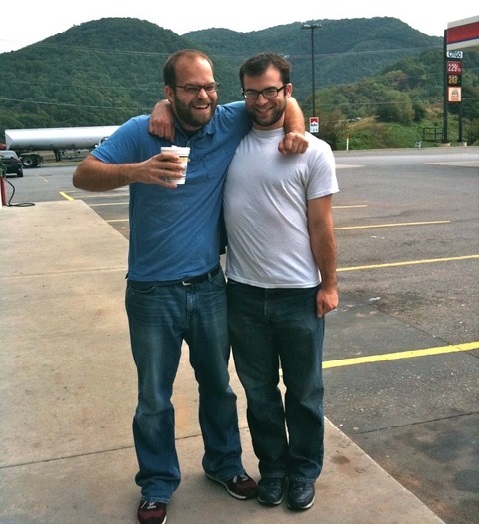 Originally called Brother Bear, the duo went on to form multiple standout ensembles before settling in as the seamless, high-energy, multi-character improv duo we now know and love. As New York City’s premier improv duo, they've received some pretty incredible reviews and press mentions. The New York Times calls Trike, "consistently complex, imaginative improv," that is “reliably one of the best improv performances in the city.” Splitsider.com says that Trike's "fantastic late night show is upbeat and impressively layered improv that is always worth checking out," and in the "Splitsider Guide to NYC Comedy Scene,” Trike was named one of eight "Best Weekly Shows." TimeOut New York declares Trike a "Critic's Pick" that "melds playful physical transformation and careful scene work in a weekly show that delivers an impressively quick and detailed overlap of events in its conclusion." That's a lot of praise for two guys making up everything in the moment. But what improv magic make a Trike show so unique? Trike has no scene breaks. You won’t hear an audience clap during transitions at a Trike show, because the next scene has already begun. The incredible balance between relatable, heartfelt characters and kinetic, abstract absurdity is like none other. By the end of a Trike show, every scene has proven itself essential to the whole. There’s always a reason these seemingly random collection of scenes find themselves in the same performance. Instead of one trying to interpret the other’s intentions, like a puzzle with only one solution, Peter and Nick see each other as inkblots, eager to be interpreted by the other’s intuition. This creates the illusion of foresight and a feeling that one can read the other’s mind. Plus, they're pretty good friends. That helps too. - Peter & Nick attended Northwestern University together, where in 2003 Peter cast and coached Nick in his first long form improv group. - Peter moved to NYC in 2005 just after the opening of Magnet Theater. Nick joined two years later. - On February 10th, 2008 - their original duo (Brother Bear) premiered at the Magnet duo show, Ampers&nd. - They soon launched Statues of Liberty with fellow NU alumni Russ Armstrong and Chris Hejl and performed 77 shows together at the Magnet. - Trike, the duo, began May 2011 and has since done 301 shows on Saturday nights at Magnet. - Together Nick and Peter have performed in 460 shows. Come see this incredible duo celebrate their 10th anniversary this Saturday, February 10th, at 9 PM. It's gonna be a wild one.